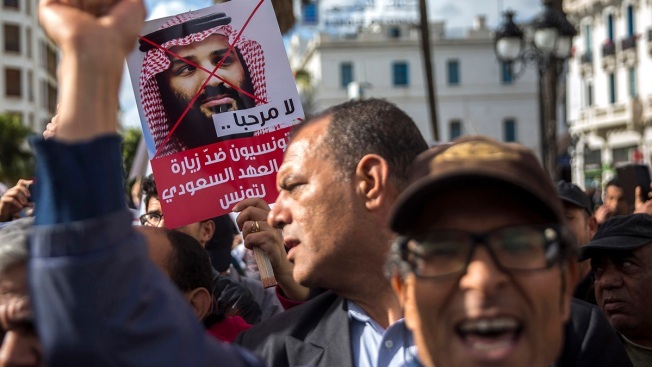 Tunisians demonstrate with placards reading 'You are not welcomed' and showing Saudi Crown Prince Mohammed bin Salman, Nov. 27, 2018, in Tunis. Saudi Crown Prince Mohammed bin Salman received a personal welcome Tuesday from Tunisia's president who greeted his guest at the airport after two days of protests in the capital that reflected international concern about the killing of Saudi journalist Jamal Khashoggi. The official welcome contrasted with hostile protests by non-governmental representatives and leftist political parties with more than 200 protesters on Tuesday to cries of "Tunisia is not for sale." Some burned a Saudi Arabian flag and others brandished saws. A banner showing a doctored image of the prince holding a bone saw hung on the headquarters of the Tunisian journalists union. Turkish officials say Khashoggi's body was dismembered in the Saudi Embassy in Istanbul last month. President Donald Trump last week vowed to stand by Saudi leaders despite the CIA's report that the slaying of Khashoggi likely came at the crowd prince's request, as NBC News reported. In Tunisia Monday about 200 protesters gathered in the same spot to say the crown prince wasn't welcome in this North African nation. A youth activist group that criticizes Saudi limits on women's rights was among those demonstrating Tuesday. "No to Repression of Freedom of Expression" read one sign. "We're here to say no, 1,000 times no to the visit by the criminal bin Salman," said protester Said Arous. Prince Mohammed is not exposed to this kind of protest back home, where he's engaged in a crackdown targeting business leaders, human rights activists and other royals. On his tour's first stop, in the United Arab Emirates, the Saudi prince was embraced on the tarmac by Abu Dhabi Crown Prince Mohammed bin Zayed, a close ally. He also went to neighboring Bahrain, an island nation that functions as a vassal state to Saudi Arabia and to Egypt. Tunisian President Essebsi's office said Tunisia denounces the journalist's killing and wants a full investigation, but doesn't want it to be used to destabilize Saudi Arabia. 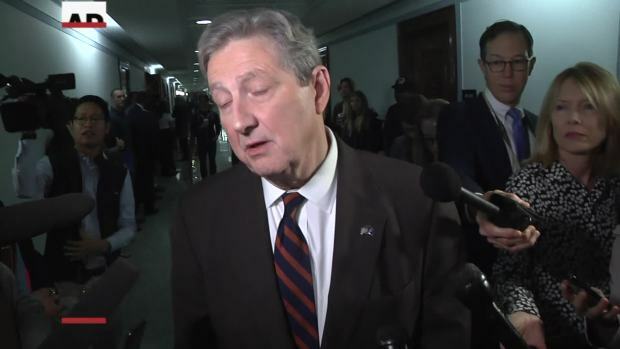 Asked about the prince's visit, Tunisian government minister Selma Elloumi said he is "welcome" in Tunisia and stressed "historical and fraternal" relations between the countries. But many Tunisians are angry over the killing and suspicions of the prince's involvement. "He is coming to this country to dirty it, and acquire a false legitimacy," Tahar Yahya, of the Tunisian Order of Lawyers said Monday night. "We don't want the money of a regime whose hands are stained with blood." His group tried to seek a court order blocking the prince's visit. The Tunisian journalists' union sent a letter to the president calling it an "attack on the principles" of the 2011 revolution that brought democracy and freedom of expression to Tunisia. A dozen Tunisian non-governmental organizations issued a joint statement saying the visit is aimed at cleaning up Prince Mohammed's image after the Khashoggi death, and denounced "flagrant violations of human rights and repressive practices against freedom of speech" in Saudi Arabia. The Tunisian journalists' union and a collective of 50 lawyers have filed two legal complaints against the prince for alleged crimes against humanity in Yemen, where a Saudi-led coalition is fighting Shiite rebels, and repression of freedom of expression. It's unclear whether Tunisian authorities will take action on the complaints.